"I'm an engineer, not a poet." Nuparu is the inventive Toa Mahri of Earth and the former Toa Inika of Earth. Nuparu was originally an Onu-Matoran from Metru Nui. On Mata Nui, Nuparu worked as an engineer; his invention the Boxor was instrumental in staving off the Bohrok Invasion. Some time later, Nuparu traveled with Jaller and four other Matoran on a rescue mission to Voya Nui. There Nuparu and his companions transformed into Toa and sought out the Mask of Life. After The Rebuilding, Nuparu modified the Boxors slightly so they could better fit the Matoran's new forms. After Jaller organized a strike in Metru Nui, Nuparu, Hahli, Hewkii, Matoro, and Kongu joined the Ta-Matoran, and took off to find the missing Toa Nuva after Turaga Nokama told Jaller about the missing Toa. The six Matoran journeyed to the realm of Karzahni with Takanuva. They traveled through an Underwater Chute, and passed unharmed through the Tunnel of Darkness. However, they encountered a stone arch that would not allow any light to pass through, thus separating the Matoran from Takanuva. Upon first entering the water, Nuparu and the other Mahri were confronted by a giant Venom Eel enlarged by the Mask of Life. Their masks and tools altered, the Toa were forced to adjust to the change in the middle of combat. After a brief battle, Hewkii used his new Garai to sink the eel to the bottom of the ocean. The six Toa then proceeded towards Mahri Nui, where they immediately came into conflict with the local Matoran. Jaller eventually convinced the Matoran that he and his team were not there to harm them, and the Toa of Fire had Matoro converse with Defilak, the head of the Mahri Nui council. Per their agreement with Defilak, the rest of the Toa set out to free the Fields of Air. Unfortunately, the Toa were captured by the Barraki, who imprisoned the Toa in small coves guarded by sea creatures. Using their masks and powers, the Toa escaped their confinement, and they split up to search the ocean. Nuparu stumbled upon a cave filled with weapons. Testing a Cordak Blaster, Nuparu deemed it satisfactory. Hewkii met up with Nuparu then and took a load of Cordak Blasters. The Toa of Stone found his teammates, who each took one of the weapons, with Kongu forgoing his melee weapon for a second blaster. Nuparu and Hewkii then joined their fellow Toa, where they were informed that they had to destroy the Cord as part of their task to save Mata Nui. This would cause Voya Nui to sink beneath the ocean and crush Mahri Nui. Thus, the Toa evacuated the Matoran from Mahri Nui and led them up the Cord to safety. Along the way, the Toa were ambushed by the Piraka, who had been mutated into sea snakes. They were saved by a timely blast of electricity from Axonn, who took the Piraka into custody and brought the Matoran and Toa to Voya Nui. Axonn informed the Toa that he would hide the Matoran on Voya Nui. He also took the Toa to a chamber containing the Toa Terrain Crawler, which transported them back to Mahri Nui. Beneath the waves once again, Nuparu helped Hahli delay the Barraki, and the two went to the aid of Hewkii, who was losing against the Gadunka. The united Toa won the fight and prepared to destroy the Cord, but they were interrupted by the revived Gadunka, the enlarged Venom Eel, and an ancient creature that Kongu had summoned earlier. With the others knocked out, Nuparu attempted to delay Gadunka, but he was struck down by the creature. Gadunka tried to grab the Ignika from Matoro's hands, but the mask shrunk the Rahi down to his normal size. After a short confrontation with Hydraxon, the Mahri destroyed the Cord. Its anchor destroyed, Voya Nui plunged into the sea and crushed Mahri Nui before sinking deeper into the ocean. Nuparu and his teammates followed the island until they were stopped by the Barraki. At this moment, Mata Nui died. The Toa, however, were determined not to fail. As Matoro hurried after Voya Nui with the Ignika, the other Toa Mahri attempted to delay the Barraki. In a final effort, Jaller prepared to release a Nova Blast that would kill the Barraki but also himself and his nearby teammates. Matoro, meanwhile, donned the Ignika in an act of self-sacrifice to revive Mata Nui. As a last act of friendship before he died, Matoro used the Ignika to teleport the other Toa Mahri back to Metru Nui and rendered them amphibious. Jaller managed to suppress his built-up power as not to raze his surroundings. While still in Metru Nui, Nuparu joined in the effort to fend off the invading Rahkshi of Heat Vision forces led by the Skakdi warlord Nektann, who had joined forces with Teridax. [MNS, Ch. 12][OGDi: Feb 12 2010, 11:08 AM] The Toa of Earth was contacted by Takanuva, who sought his help in fixing a teleportation device used by the Makuta. [TB] Nuparu traveled to Destral, but he was unable to get the device working again. Shortly afterwards, Annona attacked the fortress and consumed the dream energy of every Skakdi there, driving them mad. The golden being's power automatically granted the maddened Skakdi's dreams, causing the fortress to dissolve and aberrations to appear in the region. [ST, Ch. 7] During the confusion, the golden being's hold on the Toa Mahri was broken, and Nuparu was released from his trance. Nuparu is a master engineer, and feels at ease when surrounded by machinery he can tinker with, continuing this passion even as a Toa. He also has a great passion for learning, and saw being a Toa as an opportunity to explore new places and study new things and creatures. While this fascination could sometimes distract him from the task at hand, Nuparu's resourcefulness saved his friends many times over. As the Toa Inika of Earth, Nuparu gained natural Earth powers, though it was entwined with lightning, due to his unnatural transformation by the Red Star. After entering the Pit and being transformed by the Ignika, he and the other Toa became water breathers and lost their lightning powers. 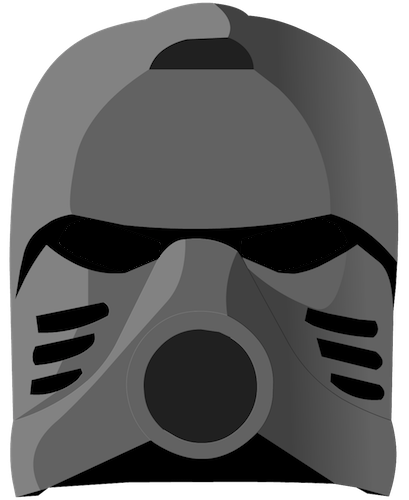 They also lost their ability to wear regular Kanohi, as their modified Mahri Kanohi were essential to their water breathing systems. When Matoro used the Ignika's power to teleport the other Toa Mahri to Metru Nui, he made Nuparu and his teammates amphibious so that they could breathe on land or in water, and Nuparu regained the ability to wear regular Kanohi. As a Toa Inika, Nuparu had a Laser Drill which could channel his elemental power intertwined with Lightning, or release a laser blast. He had a pair of Claws for digging, which were part of his hands. He also had a shoulder-mounted Zamor launcher that was loaded with Energized Protodermis. Nuparu was first released in 2002 as part of 8556 Boxor. Nuparu used seven of the set's 157 pieces. 8729 Toa Nuparu was released in summer 2006 as one of the Toa Inika canister sets, consisting of 54 pieces. In this form he featured a shoulder-mounted Zamor launcher loaded with four Zamor spheres varying in color from yellow to red. The set also included his Laser Drill, which contained a flashing strobe light in the center. 8729 could be combined with combined with parts from 8728 Toa Hahli and 8730 Toa Hewkii to create Toa Jovan. A Toa Inika Nuparu minifigure was released in the 2006 playsets 8893 Lava Chamber Gate, 8894 Piraka Stronghold, and 8624 Race for the Mask of Life. 8913 Toa Nuparu, depicting Nuparu in his Toa Mahri form, was released in the summer of 2007 and consisted of fifty-nine pieces. In his left hand he wielded a Cordak Blaster whose chambers held six mini-rockets, while three more mini-rockets were stored on his right arm which held his Razor-Edged Protosteel Shield. 8913 could be combined with 8915 Toa Matoro, 8918 Carapar, and 8919 Mantax to create the Manutri. A Toa Mahri Nuparu minifigure was released in 2007 in the playsets 8926 Toa Undersea Attack and 8927 Toa Terrain Crawler. The Nuparu minifigure featured a recolored minifigure Kanohi Faxon rather than a Kanohi Volitak. A minifigure Kanohi Volitak was released in the 2007 playsets, although only in white, yellow-orange, and green rather than silver. Nuparu was also part of McDonald's BIONICLE "Happy Meal" promotion in 2006 and 2007. The Laser Drill of the 2006 toy, depicting Nuparu Inika, lit up when a button on the side was pressed, and the claw on the left hand was poseable. The shield of the 2007 toy, depicting Nuparu Mahri, was able to freely pivot on the hand. "As soon as he had returned the Kanohi to his face, the light went out. 'That was strange,' he said, his inventor's curiosity piqued. 'That was your face,' answered Hewkii. 'Very funny,' said Nuparu. 'You're no vision of beauty yourself, Hewkii.'" "Remember that time I was hanging upside down in a swamp hole, just above some hungry mud crawlers? You know, the ones with the acidic tongues and the breath that smells like Tarakava that's been out in the sun too long?" "Those were the good old days, huh?" "Oh, I've been crazy for years... Ask anyone." "I know a way out ... it involves explosions ... lots of explosions..."
"I've never had an island fall-drop on my head before. This should be interesting." The Toa Mahri Nuparu set was originally to wield a shield and the Aqua Blaster Blade. The final product, meanwhile, only carried a shield. Nuparu is still depicted with the Aqua Blaster Blade in Downfall, and as such the weapon is canon. The official appearance of the Aqua Blaster Blade was later the subject of a fan competition; the winning design was built by BZPower and BIONICLEsector01 member Terakk. This page was last edited on 16 March 2019, at 05:14.